THIS IS A LEGAL AGREEMENT BETWEEN CUSTOMER AND PRACTICECOMPASS LLC. BY ACCESSING AND/OR USING THE SERVICE, CUSTOMER IS AGREEING, ON BEHALF OF AN INDIVIDUAL AND/OR A LEGAL ENTITY, TO BE BOUND BY THE TERMS OF THIS AGREEMENT. 1.1. Agreement means this End User Service Agreement and any Services Description or any other documents incorporated herein by reference. 1.2. Confidential Information means any non-public information and/or materials provided by a party under this Agreement to the other party, and reasonably understood to be confidential. Confidential Information does not include Uploaded Data or Metadata. 1.3. Customer means the legal entity or individual that has ordered a Service from PC LLC by executing an Order and has the right to use the Services subject to the terms of this Agreement. 1.4. Effective Date means the date of Services activation by PC LLC. 1.5. Infringement Claim means any claim, suit or proceeding brought against a Customer based on an allegation that the Services, as delivered by PC LLC and used by Customer in accordance with this Agreement, infringes upon any patent or any copyright or violates any trade secret rights of any third party. 1.6. Metadata includes system data about end users and Uploaded Data that enables user authentication and application features and enforces permissions/privileges over Customer’s Service account. 1.7 PracticeCompass LLC means PracticeCompass LLC, a Delaware limited liability company (hereinafter “PC LLC”). 1.8. Order means any purchase order or other ordering document submitted to PC LLC through its website for the purposes of ordering Services under the terms and conditions of this Agreement a copy of which is provided to the Customer by email subsequent to the Customer placing such Order. 1.9. Order Confirmation mean the email confirmation that shall delineate the services, options, and number of licenses that Customer purchased, which shall be generated upon Customer placing an Order through PC LLC’s website. 1.11. Services means the generally available services provided by PC LLC to Customers for Practice Compass™ software as described in the applicable Service Description, including end-user software provided with a Service. PC LLC may update the Services at any time in its sole discretion and all Services set forth in the Services Descriptions may not be available to all Customers. 1.12. Services Description means the specific terms applicable to the Services and that apply to Customer’s use of the Services selected by the Customer in the Order, as set forth at www.PracticeCompass.com/service-description and hereby incorporated herein by reference. 1.14. Subscription Term means the term for the services as subscribed to by Customer, as set forth in the Order and as further defined in Section 3 below. 1.15. Uploaded Data means data that Customer or Customer’s users upload to Customer’s Service account for storage and/or transfer to third parties, typically in the form of files and documents. 2.1. Customer Access. During the Subscription Term of this Agreement, and upon payment of all applicable Subscription Fees, Customer may access and use the Services pursuant to and in accordance with the provisions of this Agreement. If Customer is required to install and download Practice Compass™ software from PC LLC’s website in connection with the Services, PC LLC provides Customer with a limited, personal, non-exclusive, non-transferable, non-sublicensable right to use the software in accordance with the provisions of this Agreement. Customer/technical support for the Services is available via the support website at the link listed in the applicable Services Description. 2.2. Reverse Engineering Forbidden. Customer may not modify, distribute, prepare derivative works of, reverse engineer, reverse assemble, disassemble, decompile or otherwise attempt to decipher any software that PC LLC pay provide to customer and/or any other aspect of PC LLC’s technology. 2.4. Software Improvements. PC LLC may perform scheduled or unscheduled repairs or maintenance, or remotely patch or upgrade the Practice Compass™ software or any other Services installed on PC LLC’s and/or Customer’s system(s), which may temporarily degrade the quality of the Services or result in a partial or complete outage of the Services. Updates, patches or alerts may be delivered from PC LLC’s servers. PC LLC provides no assurance that Customer will receive advance notification of such activities or that Customer’s use of the Practice Compass™ software will be uninterrupted or error-free. 2.5. Resale Forbidden. Customer shall not market, offer to sell, sell and/or otherwise resell the Services or any software provided in connection with the Services to any third party. 2.6. No Representation by Customer. Neither Customer nor any of its employees, representatives or authorized users of the Services under Customer’s account shall make any representations with respect to PC LLC, the Services or this Agreement (including, without limitation, that PC LLC is a warrantor or co-seller of any of Customer’s products and/or services). 2.7. Limited Grant of Rights. No other rights are granted hereunder to Customer except as expressly set forth in this Agreement. 2.8 Technical Specifications. You must have computer hardware that is capable of downloading and utilizing the Practice Compass™ software. You must also use the operating system(s) and software that satisfies all technical specifications and other requirements PC LLC may establish and specify which specifications may change from time to time. The Technical Specifications shall be delineated at www.PracticeCompass.com/technical. 3. Term, Termination, and Payment. 3.1. Term. The terms and conditions of this Agreement shall be in effect commencing on the Effective Date and continuing for the Subscription Term. Customer shall have a monthly subscription that shall automatically renew upon each month. Customer may terminate the agreement upon providing PC LLC with thirty (30) days’ notice. Customer’s subscription shall continue to renew monthly in absence of such notice form the Customer. 3.2. Termination for Cause. At any time, either party may terminate this Agreement immediately upon written notice to the other party (i) if the other party breaches any of its material obligations under this Agreement and such breach is not cured within thirty (30) days of receipt of written notice from the non-breaching party, or (ii) if the other party becomes insolvent or bankrupt, liquidated or is dissolved, or ceases substantially all of its business, or (iii) in the event of a breach by the other party of Section 4 (“Confidentiality”). In addition, PC LLC may terminate this Agreement immediately upon written notice to Customer in the event Customer breaches Section 2 (“Customer Rights and Restrictions”). 3.3. Effect of Termination. Upon termination of this Agreement, Customer will immediately discontinue (i) all access to and use of the Services and any software provided in connection with the Services, (ii) all rights and licenses of Customer under this Agreement shall terminate and Customer shall not have access to or use of the Service or any data or information that Customer previously accessed via use of the Service and (iii) all outstanding invoices immediately become due and payable by certified, cashier’s check, or other means acceptable to PC LLC, and (iv) representing that Customer is a user of the Services PC LLC will immediately disable Customer’s account upon termination. Customer will no longer have any access to PC LLC’s databases or data storage and will not be able to access data stored on PC LLC’s servers. Neither party shall be liable for any damages resulting from a termination of this Agreement in accordance with this Section 3; provided, however, the termination of this Agreement shall not affect any claim arising prior to such termination. The applicable definitions, use restrictions, confidentiality terms, intellectual property rights, warranty disclaimer, limitation of liability, contracting parties, and applicable additional terms set forth in Section 11 shall survive termination or expiration of this Agreement. 3.4 Payment. PC LLC shall keep the Customer’s credit card on file and shall monthly charge the Customer’s credit card on a monthly basis the monthly subscription fee for the Services the Customer purchases per the Order. PC LLC shall also as appropriate charge the Customer’s said credit card for other products and services in addition to the Services for which Customer is already paying a monthly subscription fee. PC LLC shall provide at least 30 days’ notice of any changes to a Customers’ prices and fees and shall implement such price changes on the next applicable monthly billing cycle. PC LLC may apply a surcharge for applicable federal, state, and municipal telecom, sales, use, excise, and other taxes and fees on telecom goods and services as such may be applicable or change from time to time. If at any time Customer is delinquent in the payment of any invoice, or is otherwise in breach of this Agreement, PC LLC may, in its discretion, and without prejudice to its other rights, terminate the Customer’s ability to use the Services and may require Customer to prepay for further right to use the Products and/or withhold the provision of Services until complete payment has been received. PC LLC is not under any obligation whatsoever to provide Customer to any access to any data or other access until such time as Customer makes the necessary payment requested by PC LLC. Any sum not paid by Customer when due shall bear interest from the due date to the date of payment, such interest to run day to day and after as well as before any judgment at a rate of (i) nine per cent per annum or (ii) the maximum rate permitted by law, whichever is less. All payments of any kind that any Customer may make shall be nonrefundable. 3.5 Rejection of Order. PC LLC may reject any Order placed by any customer within ten business (10) days of receiving Order for any reason subject to its sole and unfettered discretion. PC LLC shall refund all amounts paid by Customer within ten (10) business days of rejecting such order. 4. Confidentiality. Each party retains all rights to any and all of its Confidential Information. Unless expressly authorized in writing by the other party, neither party shall disclose to any third party any Confidential Information of the other party, nor use such Confidential Information in any manner other than to perform its obligations under this Agreement. The foregoing restrictions do not apply to any information that (i) is publicly disclosed through no fault of the receiving party, (ii) is already lawfully in the receiving party’s possession and not subject to a confidentiality obligation to the disclosing party, (iii) becomes known to the receiving party from a third party having an apparent bona fide right to disclose the information, or (iv) is Confidential Information that the receiving party is obligated to produce pursuant to an order of a court of competent jurisdiction or a valid administrative subpoena, provided receiving party supplies disclosing party with timely notice of such court order or subpoena. 5. Uploaded Data. Customer retains all rights to any and all of its Uploaded Data. PC LLC shall not own or license any data, content, information or material in Customer’s Uploaded Data. PC LLC shall not view, access or process any Customer Uploaded Data, except as necessary for the sole purpose of providing the Services to Customer and its users, as required by this Agreement, PC LLC policies, and/or applicable law. PC LLC and Customer shall apply reasonable technical, organizational and administrative security measures to keep Uploaded Data and Metadata protected in accordance with industry standards. Customer is solely responsible for the configuration of its Service account and configuration, operation, performance and security of its equipment, networks and other computing resources, including its gateways or other devices and networks used to connect to the Services. Customer shall retain a current copy of Uploaded Data outside the Services. Customer shall comply with all intellectual property laws related to the Uploaded Data and legal duties applicable to Customer as a data controller by virtue of Customer submitting Uploaded Data to or storing Uploaded Data within the Services. Specifically, Customer shall provide the relevant persons and/or participants with all information or notices Customer is required by applicable privacy and data protection law to provide and, if necessary, obtain the consent of or provide choices to such persons and/or participants as required by such laws. Customer may store in, the Services, protected health information (PHI) for which the Business Associate Agreement (BAA) posted at www.PracticeCompass.com/business-associate-agreement and hereby incorporated herein by reference shall then apply to such PHI. Additional charges may apply for a PHI Service offering. The BAA may be updated by PC LLC at its sole discretion from time to time without notice (but will be noted by its last updated date) and may be reviewed at such website. 6. Proprietary Rights. Subject to the terms contained End User License Agreement posted at www.PracticeCompass.com/end-user-license-agreement. PC LLC grants to Customer a non-exclusive, non-transferable license to use the Practice Compass™ software. Any resale of the Practice Compass™ software to any person or entity is expressly prohibited. Customer has no right, title or interest in or to the Services or any other software provided in connection with the Services or any intellectual property rights related thereto. 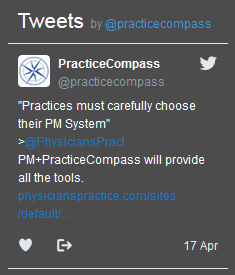 Customer may not sublicense, to any person or entity, any rights to distribute the Practice Compass™ software. Customer acknowledges that PC LLC or its licensors retain all proprietary right, title and interest in and to the Services and any software, including, without limitation, all modifications, enhancements, derivative works, configuration, translations, upgrades and interfaces thereto. Customer may not sublicense, to any person or entity, any rights to distribute the Software or Documentation. 7. DISCLAIMER OF WARRANTY. PC LLC HEREBY DISCLAIMS AND CUSTOMER WAIVES ALL REPRESENTATIONS, WARRANTIES, CONDITIONS OR OTHER TERMS (WHETHER EXPRESS, IMPLIED, OR STATUTORY), INCLUDING, WITHOUT LIMITATION, ANY WARRANTY, CONDITION, OR TERM (A) OF MERCHANTABILITY, FITNESS FOR A PARTICULAR PURPOSE, REASONABLE CARE AND SKILL, NON-INFRINGEMENT, SATISFACTORY QUALITY, ACCURACY, OR SYSTEM INTEGRATION, OR (B) ARISING FROM ANY COURSE OF DEALING, COURSE OF PERFORMANCE, OR USAGE IN THE INDUSTRY. TO THE EXTENT PERMITTED BY LAW, IF A WARRANTY, CONDITION, OR TERM CANNOT BE DISCLAIMED, SUCH WARRANTY, CONDITION, OR TERM SHALL BE LIMITED IN DURATION TO THE APPLICABLE EXPRESS WARRANTY PERIOD. PC LLC MAKES NO REPRESENTATIONS OR WARRANTIES, AND THERE ARE NO CONDITIONS, WHATSOEVER, WHETHER EXPRESS OR IMPLIED OR ARISING BY STATUTE OR OTHERWISE IN LAW OR EQUITY OR BY CUSTOM, COURSE OF DEALING OR TRADE USAGE, AND TO THE EXTENT PERMITTED BY APPLICABLE LAW, SPECIFICALLY DISCLAIMS ANY IMPLIED WARRANTIES OR CONDITIONS OF TITLE, NONINFRINGEMENT, MERCHANTABILITY OR FITNESS FOR A PARTICULAR PURPOSE IN CONNECTION WITH ANY THIRD PARTY SOFTWARE OR OPEN SOURCE SOFTWARE. 8.1. Defense or Settlement of Claims. Subject to Sections 8.2 and 8.3 below, PC LLC shall indemnify and defend Customer against any Infringement Claim brought against Customer, provided Customer promptly notifies PC LLC of an Infringement Claim such that PC LLC is not prejudiced by any delay of such notification. PC LLC shall pay reasonable attorney’s fees, court costs, and damages finally awarded with respect to such Infringement Claim and the reasonable costs associated with any settlement of any Infringement Claim by PC LLC. PC LLC will have sole control over the defense and any settlement of any Infringement Claim and Customer will provide reasonable assistance in the defense of it. PC LLC will reimburse Customer for reasonable expenses incurred in providing such assistance. 8.2. Infringement Cures. Following notice of an Infringement Claim, and in the event an injunction is sought or obtained against use of the Services subscribed to hereunder or in PC LLC’s opinion is likely to be sought or obtained, PC LLC shall, at its option and expense, either (i) procure for Customer the right to continue to use the Services, or (ii) replace or modify the Services to make their use non-infringing while being capable of performing the functions as described in the applicable Service Description. In the event the options set forth in Subsections (i) and (ii) herein above are not reasonably available, PC LLC may in its sole discretion, upon written notice to Customer, terminate this Agreement, cancel access to the Services and refund to Customer any prepaid, but unused Subscription Fees for the affected Service, if any. 8.3. Limitation. PC LLC assumes no liability, and shall have no liability, for any Infringement Claim based on (i) Customer’s access to and/or use of the Services after notice that Customer should cease use of such Services due to an Infringement Claim; (ii) any modification of the Services by Customer or at its direction; (iii) Customer’s combination of the Services with third party services, programs, data, hardware, or other materials; or (iv) any trademark infringement involving any marking or branding not applied by PC LLC or involving any marking or branding applied at Customer’s request. 8.4. Exclusive Remedy. THIS SECTION 8 STATES THE CUSTOMER’S EXCLUSIVE REMEDY WITH RESPECT TO ANY INFRINGEMENT CLAIM. 9. LIMITATION ON LIABILITY. NEITHER PC LLC, nor its SUPPLIERS NOR ITS OFFICERS, AGENTS, OR EMPLOYEES SHALL BE LIABLE FOR ANY INDIRECT, SPECIAL, CONSEQUENTIAL, INCIDENTAL, MULTIPLE, OR PUNITIVE DAMAGES (INCLUDING, WITHOUT LIMITATION, DAMAGES FOR LOSS OF DATA, LOSS OF INCOME, LOSS OF OPPORTUNITY, LOST PROFITS, COSTS OF RECOVERY OR ANY OTHER DAMAGES), HOWEVER CAUSED AND ON ANY THEORY OF LIABILITY, AND WHETHER OR NOT FOR BREACH OF CONTRACT, NEGLIGENCE, OR OTHERWISE, AND WHETHER OR NOT PC LLC OR ITS SUPPLIERS OR LICENSORS HAVE BEEN ADVISED OF THE POSSIBILITY OF SUCH DAMAGES. THESE LIMITATIONS WILL APPLY NOTWITHSTANDING ANY FAILURE OF ESSENTIAL PURPOSE OF ANY LIMITED REMEDY PROVIDED HEREIN. THE TOTAL CUMULATIVE LIABILITY OF PC LLC, ITS SUPPLIERS AND LICENSORS ARISING OUT OF THIS AGREEMENT, INCLUDING ANY TERMS INCORPORATED BY REFERENCE, INCLUDING ANY BAA, SHALL BE LIMITED TO THE SUM OF THE AMOUNTS PAID OR DUE FOR THE RELEVANT SERVICE DURING THE TWELVE (12) MONTHS IMMEDIATELY PRECEDING THE INCIDENT GIVING RISE TO THE LIABILITY. THE FOREGOING SHALL NOT LIMIT CUSTOMER’S OBLIGATIONS TO PAY ANY FEES AND/OR OTHER SUMS DUE HEREUNDER..
10. Contracting Party, Choice of Law and Location for Resolving Disputes. The validity, interpretation, and performance of this Agreement shall be controlled by and construed under the laws of Illinois, as if performed wholly within Illinois and without giving effect to the principles of conflicts of law, and the Courts in Cook County, Illinois shall have exclusive jurisdiction over any claim arising thereunder. Customer acknowledges that a breach of any of the promises or covenants contained herein will result in irreparable and continuing damage to PC LLC for which there will be no adequate remedy at law, and PC LLC shall be entitled to injunctive relief and/or a decree for specific performance, and such other relief as may be proper (including monetary damages if appropriate). 11.1 Relationship of the Parties. Customer and PC LLC are independent contractors. This Agreement does not create a partnership, franchise, joint venture, agency, fiduciary or employment relationship between the parties. 11.2. High-Risk Use. Customer hereby acknowledges that the Services are not designed or intended for access and/or use in or during high-risk activities including, but not limited to: medical procedures; on-line control of aircraft, air traffic, aircraft navigation or aircraft communications; or the design, construction, operation or maintenance of any nuclear facility. PC LLC hereby expressly disclaims any express or implied warranty of fitness for such purposes. 11.3. Voice and Data Charges. Customer shall be responsible for all fees and charges imposed on Customer by Customer’s telephone carriers, wireless providers, and other voice and/or data transmission providers for voice and/or data transmission used by Customer to access and use the Services. 11.4. Assignment. Customer may not assign its rights or delegate its duties under this Agreement either in whole or in part without the prior written consent of PC LLC (which consent shall not be unreasonably withheld), except that Customer may assign this Agreement in whole as part of a corporate reorganization, consolidation, merger, or sale of all or substantially all of its assets. Any attempted assignment or delegation without such consent shall be void. This Agreement will bind and inure to the benefit of each party’s successors and permitted assigns. 11.5. Force Majeure. Neither party will be responsible for any delay, interruption or other failure to perform under this Agreement due to acts beyond its reasonable control, but only for so long as such conditions persist. Force majeure events include, but are not limited to: natural disasters (e.g., lightning, earthquakes, hurricanes, floods); wars, riots, terrorist activities, and civil commotions; activities of local exchange carriers, telephone carriers, wireless carriers, Internet service providers, and other third parties; explosions and fires; embargoes, strikes, and labor disputes; governmental decrees; and any other cause beyond the reasonable control of a party. 11.6. Notices. Any and all Services notices, requests and communications to the parties shall be in writing and will be delivered in person or by certified or registered express mail, and shall be deemed given (i) upon personal delivery; (ii) if delivered by air courier, upon confirmation of receipt. Notices shall be delivered, in the case of PC LLC, to the applicable addresses specified in in Section 10 above, or, in the case of the Customer, at the address specified on the Order. 11.7. Compliance with Laws. Both parties agree to comply with all applicable local, state, national and foreign laws, rules, and regulations, including, but not limited to, all applicable data protection, privacy, anti-spam, export and import laws and regulations, in connection with their performance, access and/or use of the Services under this Agreement. Notwithstanding the preceding sentence, PC LLC does not guarantee that the Services shall be appropriate and/or available for use in any particular context or location and Customer is responsible for compliance with local laws to the extent applicable. PC LLC reserves the right to modify the Services for any reason, without notice and without liability to Customer or any end user, to comply with applicable law. Notwithstanding any other provision in this Agreement, PC LLC shall have the right to terminate this Agreement immediately upon the determination by PC LLC that Customer is not in compliance with any applicable laws. 11.8. No Waiver. The failure of either Customer or PC LLC in any one or more instance(s) to insist upon strict performance of any of the terms of this Agreement will not be construed as a waiver or relinquishment of the right to assert or rely upon any such term(s) on any future occasion(s). 11.9. Severability. If any provision of this Agreement is declared by a court of competent jurisdiction to be invalid, illegal, or unenforceable, such provision shall be severed from this Agreement and the other provisions shall remain in full force and effect and the parties agree to comply with the remaining terms of this Agreement in a manner consistent with the original intent of the Agreement. 11.10. No Third Party Beneficiaries. No person or entity not a party to this Agreement will be deemed to be a third party beneficiary of this Agreement or any provision hereof. 11.11. Entire Agreement. This Agreement sets forth the entire agreement and understanding of the parties relating to the subject matter hereof and supersedes all prior and contemporaneous oral and written agreements and understandings with respect to the same. No waiver or amendment of any term or condition of this Agreement shall be valid or binding unless agreed to in writing by the waiving party. 11.12. Captions and Headings. Captions and headings are used herein for convenience only, are not a part of this Agreement, and shall not be used in interpreting or construing this Agreement. 11.13 Trial/Evaluation. Customer may be permitted access to certain Services for trial and/or evaluation purposes subject to the terms and conditions of this Agreement. Services acquired for trial and/or evaluation purposes are provided “as is” and PC LLC does not offer any warranties or indemnities for such Services. 11.14. Suspension of Service. If at any time continued provision of the Service would compromise the security of the Service due, without limitation, to hacking attempts, denial of service attacks, mail bombs or other malicious activities, Customer agrees that PC LLC may temporarily suspend the Service. In any such event, PC LLC will promptly inform Customer and will work to resolve the issues and re-instate the Service at the earliest opportunity. 11.15 Order of Precedence. In the event of any conflict between an Order or any incorporated BAA and this Agreement, this Agreement shall control. Nothing contained in any Order or any other document submitted by Customer shall in any way add to or otherwise modify this Agreement or PC LLC license program terms under which the Order was submitted. This Agreement may be updated by PC LLC at its sole discretion from time to time without notice (but will be noted by its last updated date) and may be reviewed at www.PracticeCompass.com/terms-of-service-end-user-service-agreement. Customer’s continued access to and use of the Service constitutes acceptance of the then-current terms of this Agreement. 11.16 Agreement Modification. PC LLC may change any of the terms of this Agreement, including the costs of the Services that Customer purchased, at any time by amending this Agreement and displaying the amended version of this Agreement on its website at version of this Agreement on its website at www.PracticeCompass.com/terms-of-service-end-user-service-agreement, where it shall also state the effective date of such amended agreement. PC LLC shall also indicate on the monthly Order Confirmation the fact that the Agreement is to be amended and the effective date this Agreement shall be amended. The purchase order confirmations shall also contain notices of new features that shall be included with the Services that the Customer purchased and the resulting changes to this Agreement, including changes in cost, as a result of such new features.